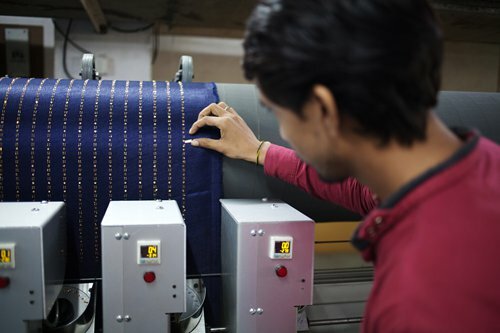 A worker inspects embellishments on a piece of fabric during the manufacturing of Lakshmipati Sarees brand garments at the Siddhi Vinayak Knots & Prints factory in Surat, Gujarat, India, on August 9, 2018. As Chinese manufacturers struggle to "walk out" as their domestic business environment becomes more competitive, India is becoming increasingly attractive for many of them. Hu Tu, a native of East China's Anhui Province, has been living in Bangalore, one of India's most progressive and developed cities, for about four years. Starting from the second half of last year, he set out to establish a small-scale factory in Bangalore to produce and process silkworm cocoon. But in the process of opening the factory, he has encountered many difficulties. "It has been about half a year since I started to set up the plant. It's a much longer process than I had anticipated for such a small-scale factory," he told the Global Times on Sunday. "The current hardships are just a period of tribulation that I, or anyone who wants to make money out of investment in India, has to walk through," he said. In Hu's observation, more and more Chinese manufacturers are experiencing the same issues. Pressed by increasing labor costs, tougher environment protection standards and an increasingly saturated domestic market, they are turning to nearby markets to set up manufacturing plants. More of them are doing this in the Indian market. "Chinese manufacturing plants in India are mostly in sectors like energy, mobile phones, electric appliances, voltage equipment and so forth," Hu said. The position of India as a rising manufacturing power is also attracting other overseas manufacturing companies. According to a Reuters report, Samsung Electronics opened a new factory in India in July, which it claimed to be the world's biggest mobile phone manufacturing plant, in order to grab opportunities in a country where mobile phone usage has been growing at a stunning rate. The report also stressed that PM Modi's flagship "Make in India" campaign has had some success with the phased manufacturing of mobile devices and components, as there are more than 120 local factories currently assembling mobile phones and accessories like chargers, batteries, powerbanks and earphones in India. Sumeet Chander, country head of global professional services provider Evalueserve who is also an Indian native, said that he knew "quite a few" overseas companies that set up plants in India in recent years or are in the process of setting up those plants. The rising appeal of India to overseas manufacturing companies has also stirred some discussions as to whether India is about to overtake China as the world's factory, as China's manufacturing industry is currently shrouded by uncertainties as a result of China's economic slowdown as well as an unfriendly global business environment. A big problem is the country's inadequate supply chain, which means that an overseas investor often finds it difficult to source components in the local market. Hu, for example, "imports" a lot of manufacturing products from China ranging from electric welders to water pumps etc. in order to complete the assembly line in his Indian plant. "In China, you can easily buy equipment from a website and there's usually sufficient stock. In India, similar products are not only very expensive but it is also hard to find sufficient supply," he disclosed. Similar problems have perplexed Chinese investors. A boiler material manufacturer in Jingjiang, East China's Jiangsu Province had told the Global Times that in India, often 7-8 out of 10 components can't be obtained from the Indian market, which makes it rather inconvenient for investors. Incomplete infrastructure network like inadequate electricity, water and transportation is also causing headaches for manufacturers in India. "It takes a very long time, sometimes even one year, for a plant to apply for commercial power. Further, because commercial power is not a stable supply, sometimes companies have to pay extra money for voltage stabilizers," Hu said. "Once you get familiar with India's business environment, it's not very difficult to make money in this country," he said. According to Hu, the price of raw materialss are quite cheap in India compared with other countries. The price of cocoons in India, for example, is approximately half the price of cocoons in China. This price gap has led to opportunities for profit, Hu said. "Other things like India's gigantic market potential as a result of its huge population, particularly its large English-speaking population, are of great appeal to manufacturers, especially international manufacturers," Zhou said. According to experts, the Indian government is making policies to support manufacturing and thus boost the local economy. In 2014, the Modi government launched the "Make in India" initiative covering 25 sectors of the economy to encourage companies to manufacture their products in India as well as increase their investment. "As far as I know, the environment of doing business in India has improved over the last few years, both for Indian companies as well as foreign companies," Chander said. Zhou said that there have been improvements in the Indian government's policies toward manufacturing and overseas investments in the past few years. "But I think those policies have not been implemented very well. It would be better if India's local governments could stay in step with the central government in terms of policy stimulation," Zhou commented. In early January, some 150 million employees in India across a number of sectors went on strike. The strike was called by 10 trade unions in the country, protesting against the Modi government's policies, which they believed to be anti-labor, according to a report of the Quartz India on January 7. But many experts have all stressed that generally speaking, the standard of India's manufacturing industry is still underdeveloped compared to China. "China now has the ability to produce different types of products - from high-quality to low-quality. The Indian market is now filled with low-quality made-in-China products or high-quality western goods, while made-in-India products don't have much presence in the markets," Hu disclosed. 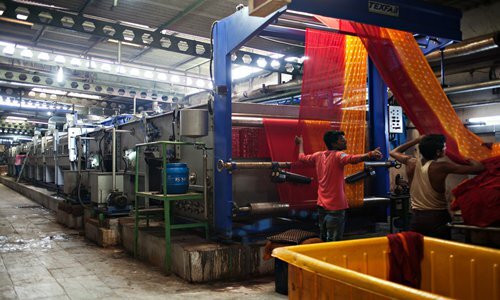 Data released by the World Bank showed that in 2017, the manufacturing sector accounted for about 15 percent of India's GDP in terms of added value. In contrast, China's manufacturing sector accounted for nearly 30 percent in the country's GDP. "But India overtaking China in manufacturing is still too much of an exaggeration," Sun commented. "It might take many more years for that to happen even though China's manufacturing industry is currently undergoing a difficult time." Chander said that China's industrial upgrading would provide some opportunities for countries like India. "I am not sure if China is interested in being the factory of the world anymore. I see China evolving to become one of the technology leaders of the world along with the US. As China evolves, there will be a vacuum in the world's factory slot which may be filled by not just India but other countries as well, such as Vietnam, Bangladesh, possibly Myanmar and certain African countries," he noted.